Every boat must carry safety equipment suitable for its size and the waters where it is used. On this page the 'coast' means the coast of the South Australian mainland and Kangaroo Island. the personal requirements of each passenger. The safety equipment must be in good working order, readily accessible and protected from water and weather. Some items of safety equipment carried on the vessel have an expiry date as a renewal reminder to ensure the equipment will work when needed, which may include life-threatening circumstances. Stickers are available from the Department to remind boaters of the safety equipment they must carry and to record the expiry dates. The safety equipment listed below is the legal minimum you must carry and includes the mandatory wearing of a lifejacket in some situations. These include all inland waters, excluding Lake Alexandrina, Lake Albert and any other waters subject to tidal influence. These are waters up to two nautical miles from the low-water mark of the coast of main land South Australia and Kangaroo Island and from the banks of Lake Alexandrina and Lake Albert (and also the Coorong). one pair of paddles or oars or other means of auxiliary propulsion (if your vessel is under 6 metres). These are waters more than two nautical miles from the low-water mark of the coast and from the banks of Lake Alexandrina and Lake Albert. the boat must be fitted with a compass, preferably liquid damped. A GPS is not a compass. a map or chart of the waters in which the boat will operate. Pumps, if the vessel has more than one compartment, enough pumps must be carried to be able to drain each compartment. be stowed as to be readily accessible in case of a fire. The fire bucket does not have to be made from metal but it must satisfy the requirements listed above. a vessel carrying more than 695 litres of flammable liquid - 9.0 kg. Having multiple small extinguishers does not satisfy the size requirement - ie if you are required to carry a 2.0 kg extinguisher, you must carry 1 x 2.0 kg fire extinguisher, not 2 x 1.0 kg fire extinguishers. However, if you are carrying the required size fire extinguisher, you may also carry additional smaller fire extinguishers. Certain types of vessel are either partially or totally exempt from these requirements. Common exemptions include personal water craft (PWC) and a range of unpowered and human-powered vessels such as sailboards, kiteboards, small sailing vessels, kayaks, canoes and rowboats. Please refer to the Harbors and Navigation Regulations 2009 for further detail. a Life jacket Level 100 or above if more than 400 m from the shore. and carry a waterproof torch or lantern when operating between sunset and sunrise. Operators and any passengers on board personal watercraft (PWC) - such as jet skis, wave-runners, wet bikes and jet boards - must wear an approved Life jacket Level 50s or above, but are generally exempt from carrying other safety equipment. Personal Watercraft are not permitted to operate in unprotected waters without approval from the CE of DPTI. a waterproof torch or lantern when operating between sunset and sunrise. 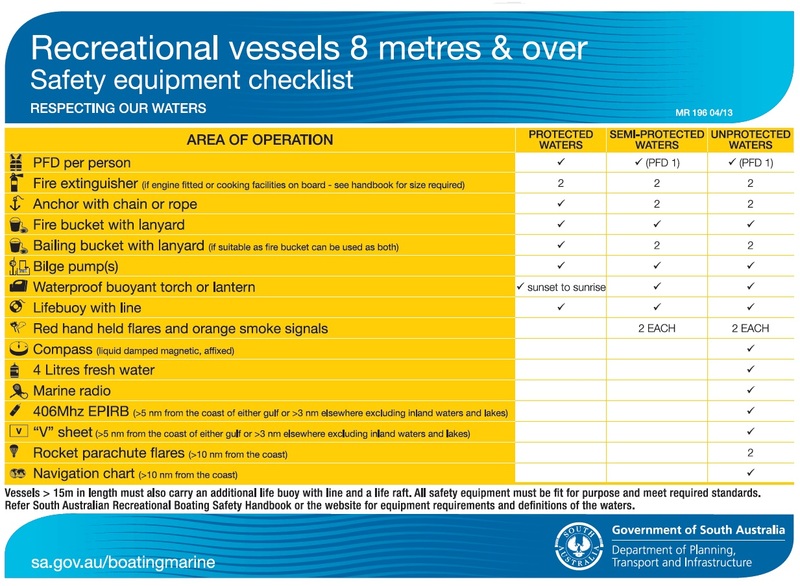 The following items must be carried, but if you are travelling in a group or with a support boat, only one of the vessels needs to have these. All vessels should stay within 50 metres of the equipped boat. Where a canoe or kayak is fitted with a small electric motor, manufactered with a maximum capacity of no more than 150 newton (33.7lbs thrust) and operated by a person 16 yrs of age or more, exemptions apply from the requirement of operator licence, registration and safety equipment for a motor vessel. This exemption applies only to kayaks and canoes. For more information go to Exemptions granted to kayaks and canoes fitted with an electric motor. a waterproof torch or lantern, when operating between sunset and sunrise. a pair of paddles or oars or other means of auxiliary propulsion. 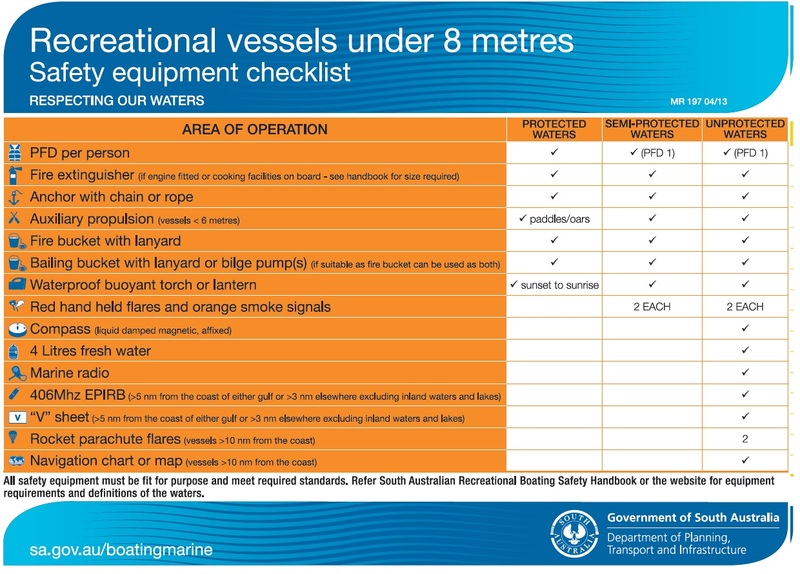 If the tender vessel is 4.8 metres or less in length and operated in Protected or Semi Protected waters, all occupants must wear a Life jacket Level 50s or above. If operated in Unprotected waters, all occupants must wear a Life jacket Level 100 or above. Several items of safety equipment carried on the vessel have an expiry date which serves to remind you to ensure the equipment will work when needed, which can include life threatening circumstances. These items include fire extinguishers, distress flares, Emergency Position Indicating Radio Beacons (EPIRB) and inflatable Life jackets. 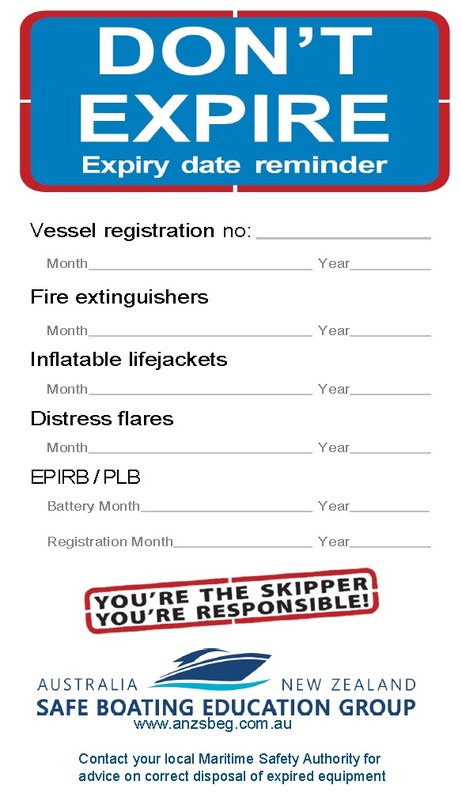 The Don’t Expire – Expiry date (141.9 KB JPG)reminder sticker has been developed to enable you to write the expiry date associated with these items of safety equipment on the sticker and stick it onto your boat in a clearly visible position where it can act as a reminder whenever you are boating. Safety Equipment checklist stickers for boats under 8 metres (380.1 KB JPG), 8 metres and over (402.2 KB JPG), and kayaks and canoes (141.9 KB JPG) are also available to remind boaters of the minimum safety equipment that must be carried on your type of vessel. For a copy of any of these stickers please contact the Boating Safety Unit by e-mail to dpti.recreationalboatingunit@sa.gov.au for a free copy.